Easter on Ibiza is a magical time to visit as its when the island starts to really wake up for the summer season. Restaurants and bars open their doors after the winter hibernation and there is a palpable buzz in the air. The most obvious sign that it is Easter comes with the centuries old processions that take place during Holy Week. You will see huge statues of the Virgin Mary and Jesus carried through the streets by the religious brotherhoods of the island. Look out for the Good Friday procession in Ibiza Town that starts from the cathedral, going into the old town. Or if in Santa Eulalia, look out for the procession going from the Puig de Missa church and into the town centre. Both begin from 20:00. With a profusion of great restaurants opening before Easter all across the island, food choices are easy. Here we show you a selection of some of the best eateries open during that time, place by place. Party lovers be aware that this month is full of them, so see our April party highlights' piece and choose one for you. If it's delicious food, beautiful presentation, superb cocktails and VIP service you want then get on over to Sa Punta, just outside Ibiza Town in Talamanca. If you want to eat the finest fresh fish, then Nobu Ibiza Bay's Japanese fusion food is well worth a try, with the "Black Cod Miso" particularly loved. Both are “treat” restaurants and offer stunning views across the water. 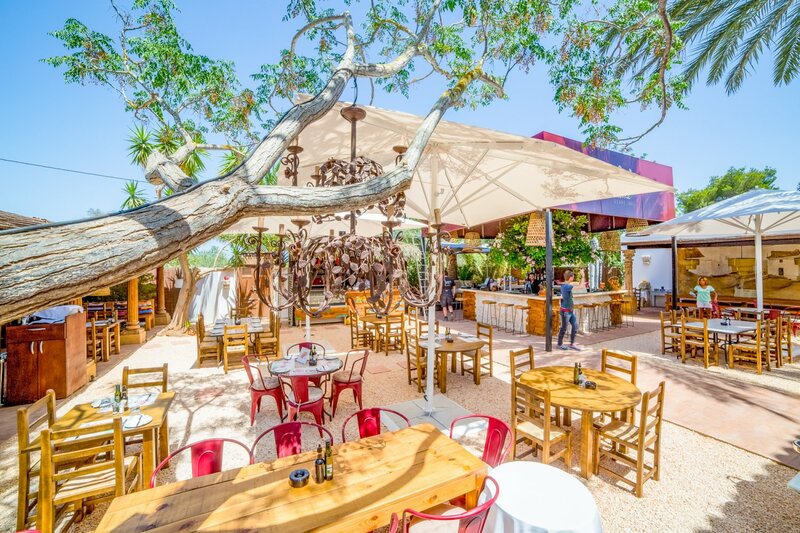 In Ibiza Town's walled citadel, El Olivo Mío opening April 17, makes for a lovely place to eat with its boho charm and excellent menu featuring fine ingredients. Dining next to the pretty cobbled street, watching people pass by is a lovely experience. On the main square of Vara de Rey, La Cava's modern take on tapas with items like burrata cheese and salmon and falafel marry well with traditional dishes such as patatas bravas and Spanish cured meats. On the long sweeping beach of Playa d'en Bossa, you can dive into the place where the jet set go: Nassau Beach Club, whose food has a touch of the Mediterranean and Asian and there's even a sushi bar. A bit farther along from here, Bali Beach is a great place to enjoy local produce with a special fixed-price lunch menu that's high on both quality and great value. If it's one of the most delicious gourmet burgers you've ever tried, The Booo close to Figueretas is a great spot to refuel and if you like spice, try the delicious chilli burger or the red hot one if you're brave. It even offers delivery too. Just outside the resort is Cas Costas Grill & Market, a rustic restaurant offering great quality food; the meat dishes are especially good and the restaurant even grows the vegetables you eat in its own garden. Along the coast at Cala Jondal, sophisticated favourite the Tropicana Ibiza Beach Club is a wonderful spot to spend the day and has a divine menu. With a massage pavilion and kids' play area, you can relax in style and comfort. For a feast in the east, there's a great selection of places for those that love great food such as traditional Ibizan cuisine at Ca Na Ribes, where you can eat on outside tables or in its lovely courtyard that's replete with a fountain. Around the corner, Royalty, a local institution, serves an excellent selection of tapas, a great fixed-price menu and more. For more of a treat on the famous “restaurant road” on the route to San Juan, Bambuddha, with its Asian and Buddhist design cues is a true foodie paradise and the fusion of Mediterranean and Asian flavours in its food is outstanding. Close by is Nagai, more Japanese fusion and a place that combines music and fashion. The fish dishes are first rate and this place does offer plenty of options for non-meat eaters too. Oh the west of Ibiza and its beautiful beaches, how we love it and the food offering here gets better all the time. In San Antonio, you can choose traditional tapas at Rincon de Pepe and marvel at the ancient tree inside. On the pretty waterfront overlooking the boats are two lovely restaurants well worth a try. The first, Villa Mercedes offers a superb fixed-price menu as well as an a-la-carte one. Housed in an old Ibizan villa, the restaurant has a lovely garden to enjoy its delicious food. The second is Río Ibiza, close by and open from Wednesdays to Thursdays until summer kicks in. Great views, tasty dishes and fun are all part of the deal here. Over in San Antonio Bay, the iconic Kumharas is a great place to go and enjoy the sunset in a lovely Bohemian setting. Its Asian-influenced food will satisfy even the most jaded of palates and the cocktails are rocking. Another fine bay institution, El Viejo Gallo has a children's playground and offers a mixed menu of local cuisine, barbecued meat and spectacular fish dishes. For a complete selection of restaurants, see our dedicated guide and put some extra gourmandising into Easter.